A German soldier rides his Motorcycle and Sidecar in a World War II camp with camouflaged tents and a truck in the background. 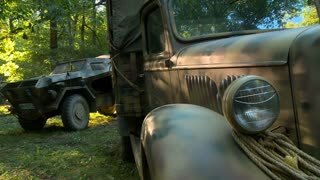 A German army military Camp in the woods in World War II with camouflaged tents, trucks, motorcycles and armored vehicles. UNITED STATES 1940s: Shadow of camouflage cover falls over ground / Soldier picks up fake rock / Soldier puts rock under camouflage. 1940s: Car stops in traffic. Truck stops in traffic. Cars slowly move in traffic. Congregation of people sitting. 1930s: truck covered in camouflage paint drives past pine trees, stops on road so man poses next to signs for Lord Baltimore Cigars and The Autographer on van and driver. 1940s: Model cars drive down road. Car stops next to yellow and red streak on road. A tanks and trucks military convoy is driven on a highway in Germany and it only stops for efficient refueling. A sergeant talks about traffic in the 1970s. 1940s: Tent barracks at military camp. Soldiers do jumping jacks. Military trucks and tanks drive in field. Soldiers train on mortars.